I have a Citibank account and it comes with an online e-banking service where I can transfer funds, view e-statements, pay bills and etc. It is a good practice to take a quick look at your e-statement daily so you will know if there are any unauthorized transactions. 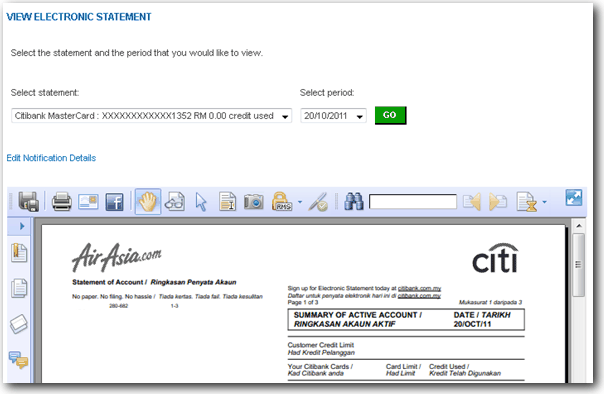 Most e-banking websites such as Maybank2u, HSBC, CIMB Clicks can show you the statement after clicking the account number without any requirement of third party software other than your web browser. However as for Citibank, one of the most annoying feature is you see the error message “You require Adobe Acrobat Reader to view your statement. Please click here to download and install the reader” when you trying to view your e-statement without Adobe Acrobat Reader installed. Even if you have Foxit Reader or Sumatra PDF installed together with firefox plugin, it still won’t work. I believe the reason why Citibank wants their users to use Adobe Acrobat Reader is because Adobe is a much more trusted company than any other PDF readers but unfortunately to me, Acrobat Reader is just bloated and there’s way too many security issues with it. So I’ve decided to figure out a way to somehow view Citibank’s e-Statement using Foxit Reader. First I viewed the HTML source code of the Citibank’s page and that there is an inline script that checks for Adobe Acrobat’s presence. So it looks like ONLY Adobe Acrobat is accepted to view the e-statement. So the next idea that hit me is spoofing. Making Firefox think that the Foxit Reader plugin is Adobe Acrobat Reader but it is actually Foxit Reader and it worked! Simply follow the simple steps below on to trick Firefox into thinking that the Foxit Reader is Adobe Acrobat Reader so that you can view Citibank e-statement without Adobe Acrobat Reader. 1. Make sure Firefox is closed and not running. 3. Select Firefox Plugin from the Service Module and click the Add button. If you don’t see Firefox Plugin on the list, probably it is already installed and you can go straight to step 5. 4. Click the Next button at the bottom of the updater Window and followed by clicking the Download button. Click the Done button to close the Foxit Reader Update Manager window. Now we will load the npFoxitReaderPlugin.dll file into any resource editor tool. We will use a free and portable Resource Editor which can be downloaded from here as an example. 6. Click the File menubar and select Open. 7. Browse to the npFoxitReaderPlugin.dll file at the following location below and click Open. 8. Click the arrow icon on the VersionInfo to expand it and click on ID 1. 9. At the English (United States) tab located at the bottom of Resource Editor, click on the ProductName and type Adobe Acrobat, replacing the original Foxit Reader plugin for Mozilla. 10. Click the File menubar and select Save. Close Resource Editor. Now run Firefox, press Ctrl + Shift + A to bring up the Add-ons Manager. Go to Plugins and you should see Adobe Acrobat in the list. You don’t have to worry about the version number because it shouldn’t cause any problems. 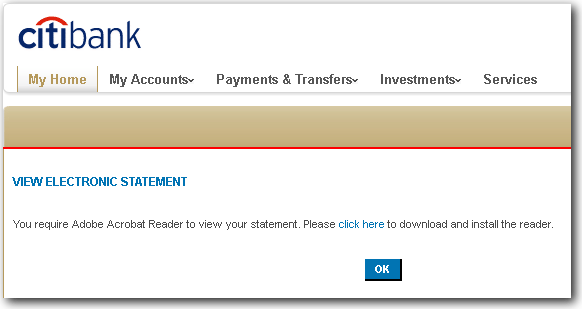 Most importantly, I can now view Citibank e-statements using Foxit Reader without being forced to install Adobe Acrobat Reader. If you are using earlier versions of Firefox and the above method does not work for you, then at step 7, try locating the npFoxitReaderPlugin.dll file from C:\Program Files\Mozilla Firefox\plugins\ folder instead and make the changes there. Firefox 8 is smart in a way that it is able to automatically detect the presence of a plugin from the default installation path and load without copying to the plugins folder. This hack has been working until recent until recent but now no longer works, evidently my bank “Pres Choice Financial” must have changed the script on their page. Ray, if it was me I’d just download Adobe Reader rather than to go through all of these techies steps.. hahaha.. In Italy, we should say: “Ne sai una più del diavolo”! Excellent, good stunt! It has always been glad if you can bypass the stupid demands! Raymond Bravo! Nice little hack! It’s always cool to get articles like this.